Picture Willem den Boer H.I. 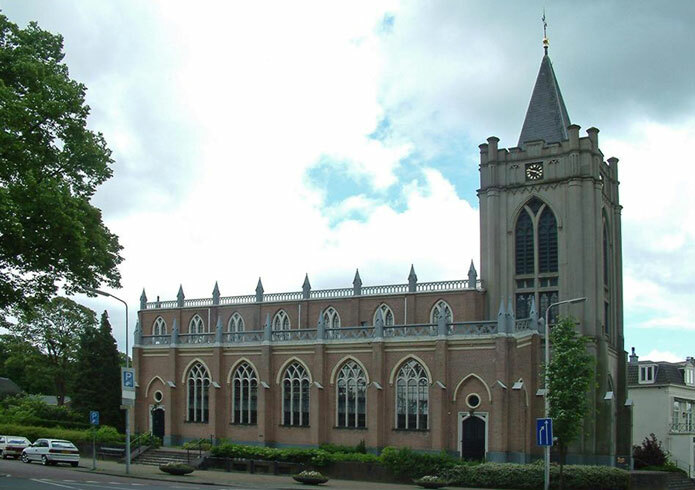 Ambacht In 1821 the Oude Kerk received its first organ, built by the organ builder J.F. Friedrichs who made use, among other things, of the organ the Joh. Baars had built in 1779 for the Walloon church in Naarden. Coupler: Hoofdwerk-Bovenwerk, Pedaal-Hoofdwerk. Tremulant on bovenwerk. Compass: C-f´ ´ ´ , Pedal compass: C-D´ . Tuning: Equal. Pitch: a´ =440 Hz. With construction of the current church, it was eventually decided to also build a new organ and in the same Gothic Revival style of the new church. Artistically this turned out to be a fortunate choice. 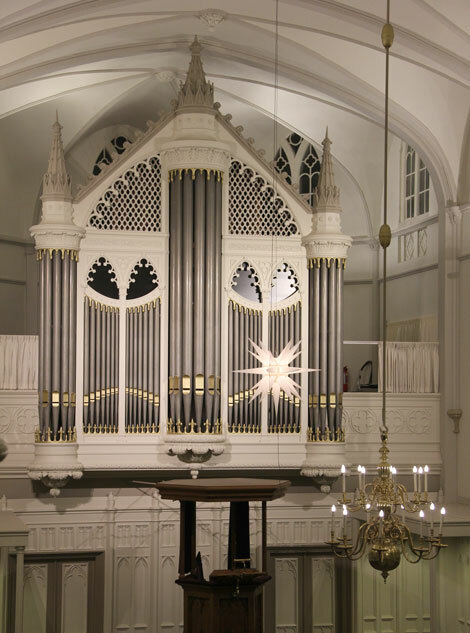 The organ, built by the organ builder Batz, was put into use on November 5, 1843. In 1909, De Koff placed the bovenwerk inside a swell enclosure and replaced the Gemshorn 2' with a Voix Celeste 8' and the Trombone 8' with a Fagot 16'. 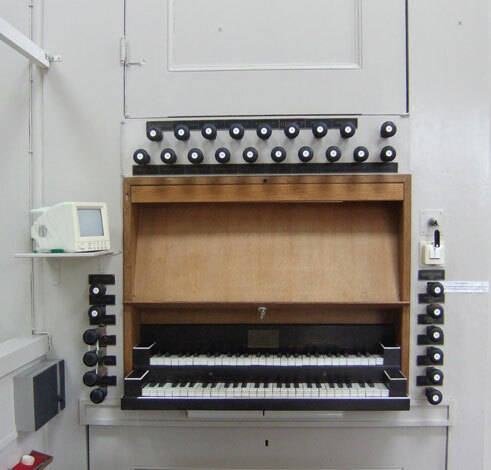 In 1977, Verschueren restored/conserved the organ using 1843 as starting point. Tuning: a' = ca. 434 Hz. 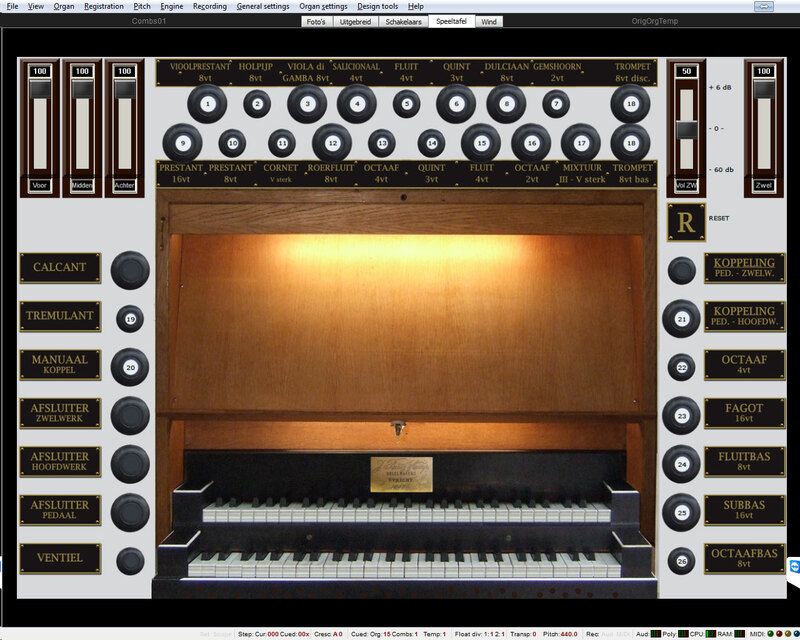 On the real organ is no tremulant for the Hoofdwerk provided. We have added one for Hauptwerk. The tremulant for the Zwelwerk is duplicated: 1st: Integral recorded and 2nd: Modulated. Not everyone likes the original tremulant, in this case you can then choose the modulated tremulant and as usual change everything including speed and depth. The 4th slider (with the caption "Vol-ZW") is definitely not a swell pedal but a volume control for the entire Zwelwerk. Using the button "R" switches it back to the normal volume. The 5th slider controls the Swell. While the pedals are not visible we have on the black tab below the Hoofdwerk LED's mounted to show wich key is pressed. The adjacent picture is a representation of the original console. All extensions we have placed on the "Advanced" tab also more suited to touchscreen users. For more see the Consoles page. The recordings for this sample set were made in Februari 2014. Number of files in this set 26,227 in 573 mappen. and to Cris van Wijk en dhr. van Randewijk who as church warden were responsible for granting permission for recording. Fred de Jong December 2016.